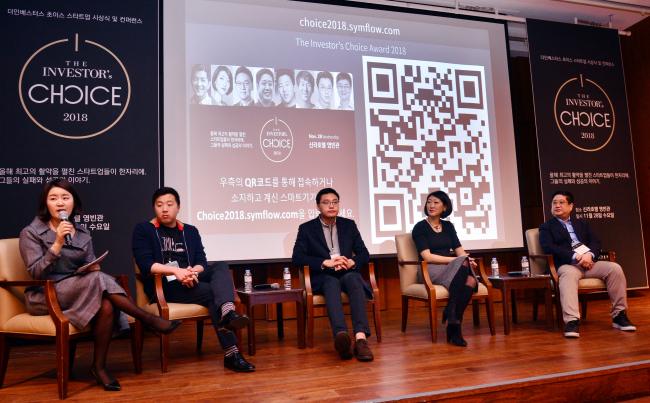 Hundreds of CEOs, investors and officials from startups and world-be entrepreneurs took part in the inaugural The Investor’s Choice, a startup conference, at Hotel Shilla in Seoul on Wednesday. The event, consisting of a panel discussion and an award ceremony, was co-organized by investment media outlet The Investor and Korea’s No. 1 English newspaper The Korea Herald in a bid to recognize the contributions of Korean startups in the local market. Kicking off the conference was a keynote address delivered via video by Jungwook Hong, the chairman of Herald Corp., the parent company of The Korea Herald and The Investor. “No startup can do everything alone. As it takes a village to raise a child, it takes a healthy and robust ecosystem to raise a company,” said the chairman, emphasizing the importance of a startup ecosystem, which can nurture and support entrepreneurs in all stages, in bringing change to the world. This was followed by keynote speeches by Fleur Pellerin, a former French culture minister who serves as the managing partner of startup venture capital firm Korelya Capital, and Lee Chang-wook, Korea country director of Money2020, one of the world’s largest financial technology conference organizers. Introducing the fast-growing European startup segment, Pellerin said the vibrant startup market in the region is attributable to the combination of talent from conventional tech companies -- such as Nokia, Ericsson and Skype -- and a new generation of entrepreneurs trained by outstanding educational institutes. “We have a large pool of tech talent and developers in Europe, approximately around 5.5 million, compared to 4.4 million in the US,” said Pellerin, citing some studies of the European startup market. 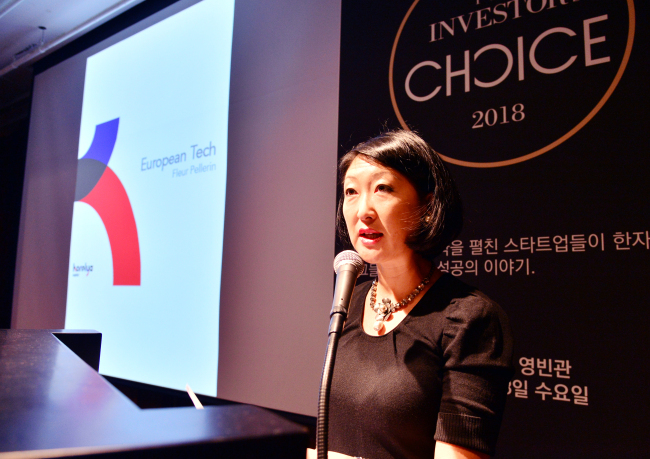 With more European startups wanting to attract investments from all over the world, especially from Asia, she said, it is the best time for Asian investors to ride on the shoulders of future giants there, while Asian startups can have a chance to work with European partners. 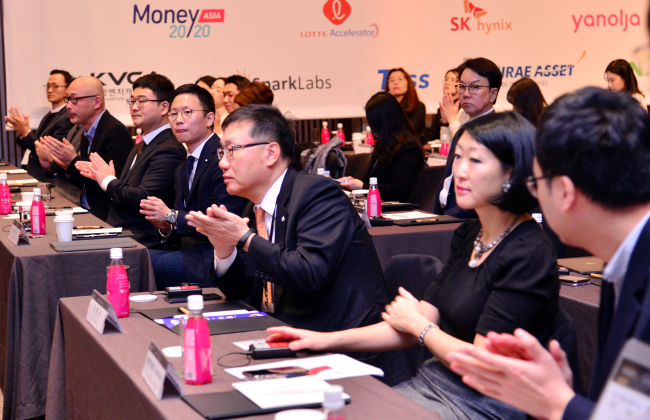 Lee, in his speech, invited fintech companies as well as non-fintech firms, such as e-commerce players, to Money2020’s fintech conferences scheduled for next year. “Fintech is now what connects different industries to each other, and participants of Money2020’s events next year will be able to find (out) how to be linked to other businesses and create value for customers,” Lee said. During the panel discussion moderated by The Investor’s Chief Editor Jemmie Kim, the panelists mostly painted a bright outlook for the Korean startup segment for the next few years. They included: Pellerin; Lee Seung-gun, CEO of Venmo-like money transfer app operator Viva Republica; Jimmy Kim, venture capital firm SparkLabs co-founder; and Matthew Shampine, WeWork Korea general manager. However, they stressed that the government and market players must make joint efforts to get rid of regulatory hurdles that prevent the birth of unicorns, or possibly, decacorn, referring to companies worth over $1 billion. “A lot of new entrepreneurs here are really into doing new crazy stuff almost every day. Some will succeed and some will not, but at the end of the day they will be able to achieve ‘The Miracle on the Han River’ once again,” Lee of Viva Republica said. Kim of SparkLabs said Korean people, in general, tend to be relatively afraid of failure, in contrast to Silicon Valley where failure are sort of medals of honor. “It seems everything should be done in one go here, which I call ‘sniper culture.’ You have to enter college with one try and you cannot fail,” said the SparkLabs co-founder, urging startups, government agencies, and entrepreneur wannabes to be more open toward and have positive views on failure. Touching on Korea’s chaebol or conglomerates, many of whose businesses span diverse sectors, including IT, manufacturing, shipbuilding and consumer, the panelists said established companies, like Samsung, Naver, and SK Telecom, do more good than bad, contrary to some critics that say such deep-pocketed traditional firms take away opportunities from small-sized companies. “I think having the larger companies here is (a) blessing. You have good, experienced people who have worked at some of these tech companies that have resources and networks like Samsung and LG. They can help small startups to shape their ideas,” the WeWork Korea general manager said.